I seem to buy an eggplant, only to have it get mushy before I have a chance to eat it. I always have big plans to make dip or some kind of pasta dish. Yet time after time, those aubergine beauties go the way of the garbage can. Not so today! OK, today's specimen was on the verge of badness. One more day and that sucker was mush. I had to discard most of it, but there was just enough for tacos. I'm not sure where the idea came from, but I figured I had nothing to lose trying it out. I made them with ingredients that I had on hand, pantry spices and veggies in the crisper. And the results? Pretty darn good, if I may say so. Alreay a whole slew of ideas for modification or embelishment are floating through my brain. Heat oil in a skillet over medium-high heat. Add garlic, cumin, cinnamon, and chili powder, tossing in the oil to disperse flavor and toast the spices. Add eggplant and bell peppers. Saute until veggies are tender, approx 5-10 minutes. Season with salt to taste. Put filling in corn tortillas and top with sour cream and green onion. *This would also make an excellent filling for veggie burritos. This was such a simple recipe, but it can pack quite a punch. It is easy to modify the spices to your own palate (mild all the way up to mouth burning goodness.) 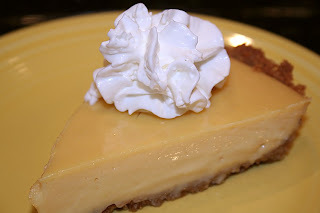 The cinnamon gives the filling such a unique flavor. The tacos by themselves are a great snack or a light meal. For a full meal you can serve them with rice and beans. As I sit here typing, a rich chocolaty aroma has begun to permeate my apartment. Yesterday as I was walking through Traders Joe's I was nearly felled by an intense craving for something chocolate and chewy. Brownies! I needs dem now!!!!! I was unable to assuage the cravings beast last night, so I am taking care of it this morning. Gluten Free Pantry Truffle Brownie mix, here I come. Until these darlings come out of the oven, I will share with you my recent cooking adventure. Summer is a wonderful time in my life. Summer vacation! No school. No responsibilities. Tons of time for reading. Tons of time for cooking. I have started hitting up the farmers markets in the city. Local produce and products just seem better. Although, sadly, not cheaper. Oy. About a week ago I snagged a small batch of asparagus and a jar of sun gold tomato preserves. That's correct, tomato jam. Sun Gold tomatoes are heirloom cherry tomatoes known for their incredibly sweet flavor. I have tried it on toast, crackers, tortillas. Then I tried it with veggies. realized that I still had potatoes and yellow bell peppers from the market. 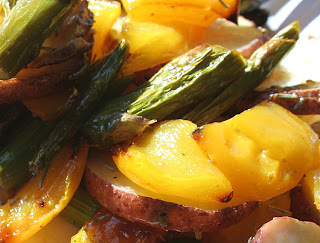 Hmmm... red potatoes, yellow bell peppers, and fresh asparagus. What to do? It was an uncommonly chilly summer day and just shy of July 4th. Since I was heading out of town for a wedding, and therefore would miss out on all the BBQs, I thought I would make some typical BBQ foods. Chicken sausage with chicken and Gouda. Oh my yum! Veggies, roasted to perfection. Preheat over to 450 degrees. Put all chopped/sliced veggies into a large zip lock bag. Drizzle with olive oil. Season with salt and pepper. Add 2-3 teaspoons of preserves. Seal the bag and shake to distribute. Spread veggies on a cookie sheet and place in the oven. Roast in oven until veggies are soft.